Ireland kaki t-shirt, 100% cotton, with a Celtic knot pattern on the front. This striking rich kaki t-shirt has a fitted look and is crafted from a quality cotton. 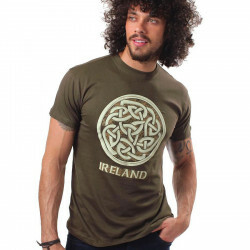 A prominent Celtic knot design front and centre with the word “Ireland” above rounds it all out.